by Dave from The Longest Way Home ~ August 15th, 2012. Updated on July 16th, 2018. Published in: Travel blog » Food around the world » Nepali food. Samosas used to put the fear of loosened bowels for days into me. Both literally and figuratively. Those meat filled pastry parcels that have been sitting under the sun all day long in a glass case beside a dusty road can be lethal to all but the hardiest of stomachs. However hot from the kitchen and made with the freshest of ingredients these take-away snacks can be very tasty, delicious and safe to eat! Where do Samosas come from? The history of the samosa is a long and debatable one. Whilst most commonly associated with the Indian Sub-Content the samosas origins can be traced back to Central Asia from 995 CE. 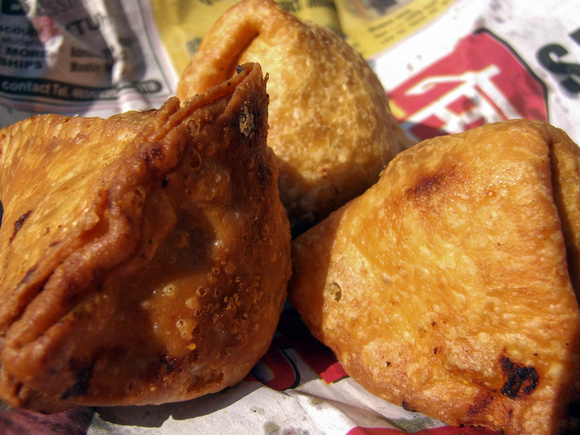 The samosas first appearance in India is between the 13th and 14 century where it was said to be introduced by Muslim traders. However there is evidence of samosa like food from as far a field as Portugal (Chamuças) and its South American colonies. North, East and West Africa all the way through the Middle East, Pakistan, India and Nepal. Due to the samosas incredible popularity variations of it can be found all over the world today . 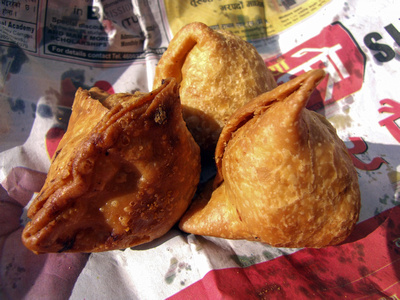 What is a Nepali Samosa made from? The main pastry base is made from white wheat flour mixed with water and oil or ghee. The inside is usually based around a potato stuffing. Adding to the stuffing is a combination of onion, lentils, ginger, chili, coriander, cumin and masala. The pastry is cut into cone shapes and filled with the stuffing. Ground meat is added to the stuffing or else it can be a purely vegetarian option. The Samosa is then cooked in hot oil. What does a Nepalese Samosa taste like? This really depends on how fresh it is and how well it was made. The samosas photographed here are fresh from a local cafe. The pastry is crisp, crunchy and wonderfully flaky. The stuffing is soft and bursting with spicy flavor. This was a pork samosa and the meat was ground well before being mixed into the potato stuffing. I started off by writing that samosas can be a travelers dietary nightmare. They are usually very spicy in terms of chili and coriander which can affect some people. Often left out all day they are renowned for quickly generating bacteria. If the samosa is not made with fresh ingredients it can add to a food poisoning likelihood. If you really want to try a samsoa in Nepal (or anywhere else) I highly recommend you buy a fresh one that’s just been cooked right in front of you. Wrapped in newspaper you can either eat it straight away or have it as a delicious take-away. This is an additional article featuring food from Nepal. Looking for restaurants and places to eat great food in the rest of Nepal? Check out my guidebook below! I had a feeling these things could give you food poisoning if left out long enough! I remember feeling a little sick off one in INdia… my intuition said it was that but my mind kept looking at this yogurt I’d bought, wondering how fresh it was. Could’ve been either, but I instinctually stayed away from samosas after. Yep, I’ve always stayed clear as well. It was only when a Nepalese friend pleaded with me to try these as they were fresh from the pan did I try. They used all sorts of dips that I stayed away from as they were not so fresh! They look so much better than the Samosas I saw in India! To be honest Jen they look better than many of the Nepalese Samosas I see everyday too! These are fresh from a Samosa shop! Okay so samosas are safe if fresh. What’s been the worst food to give you a bad stomach? Hmmm in Nepal a mutton curry – apparently they froze/defrosted the meat many times over. Anywhere else … Pakistan and a famous kebab! So so so good! I’d love some right now..